Great thing about St. Patrick's Day are the Guinness recipes. 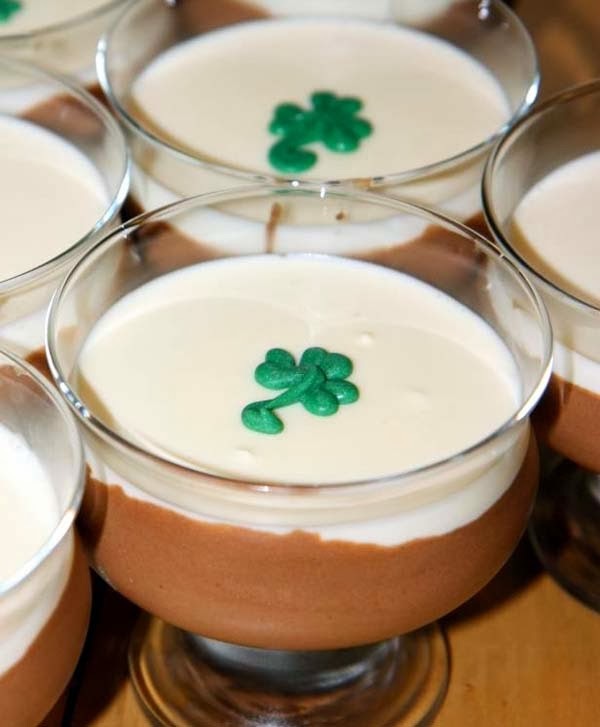 This one is for a chocolate mousse with source from http://www.food.com/recipe/guinness-black-and-white-chocolate-mousse-269057. Enjoy! BLACK CHOCOLATE LAYER: In a small bowl set over a pan of simmering water, or in a double boiler, combine the chocolate, butter and sugar. Stir until the chocolate has melted and the mixture is smooth. Stir in the Guinness and whisk in the egg yolks. Remove from the heat. In a small bowl, whip the cream with the electric mixture until soft peaks form. Fold the cream into the chocolate mixture. With clean beaters, in a medium bowl, beat the egg whites with an electric mixture until stiff peaks form. Fold the whites into the chocolate mixture. Fill eight wine or parfait glasses full with the chocolate mixture. Refrigerate while preparing the white chocolate mousse. WHITE CHOCOLATE LAYER: In a small saucepan over medium heat, combine the white chocolate and 1/2 cup of the cream. Stir until the chocolate has melted and the mixture is smooth. Remove from the heat and let cool, stirring once or twice, for 30 minutes or until thickened. In a small bowl, beat the remaining 1/2 cup of cream with an electric mixture until stiff peaks form. Fold the whipped cream into the white chocolate mixture. Spoon the mixture over the top of the chocolate mousses and refrigerate for at least two and up to 24 hours. For similar treats, see recipe for triple chocolate mousse cake.